While wolfSSL does provide one of the most secure embedded SSL/TLS libraries a high-powered and lightweight encryption engine, and other products, wolfSSL also provides various services. One of these services is the exemplary support offered by the wolfSSL support team. On average, wolfSSL receives between 700 and 800 support inquiries each year through support@wolfssl.com. These inquiries cover topics ranging from certificate signing, certificate verification errors, RSA operations, and much more. These inquiries are received, assigned to the appropriate members of the wolfSSL support team whose specialty applies to the topic, and is resolved efficiently and effectively. On average, wolfSSL support tickets are received and resolved in under 2 hours. In some cases, wolfSSL support tickets can even be resolved in under 30 minutes. These fast turnaround times can be incredibly beneficial when working on time-sensitive or blocking issues. wolfSSL Support is offered at four levels (1 free, 3 paid). Details on these support levels can be viewed in a side-by-side comparison on wolfSSL's support options page, here: https://www.wolfssl.com/products/support-packages/. To have your own questions answered, or to obtain support for wolfSSL, please contact support@wolfssl.com. Additionally, other general information about the wolfSSL library can be obtained by contacting facts@wolfssl.com. wolfSSL also supports TLS 1.3! More information can be viewed here: https://www.wolfssl.com/docs/tls13/. wolfSSL provides many different embedded, lightweight, and portable products. One of which is the wolfSSH lightweight embedded SSH Library, based on the SSHv2 protocol. wolfSSH comes with support for a long list of platforms, multiple hashing functions, SCP, SFTP, and more. Additionally, wolfSSH provides support for remote execution, one of the core features of an SSH library or SSH clients/servers. Remote execution is exactly what its name implies, the execution of commands on a device which is typically remote and may not be physically accessible from another device. wolfSSH remote execution allows the user to execute commands, update devices, and also allows the user to pipe input/output from the remote device to the client. Remote execution can be used to trigger a single action on a device, or can be used to trigger several actions. This speed up development processes on embedded devices, and can also eliminate the need for physical access in some cases. wolfTPM version 1.5.0 was recently released, and features many new updates and additions to the wolfTPM library. Added TPM wrappers for HMAC, AES Key Loading. Added Benchmarking support for RNG, AES, Hashing and TLS. Improvements for TLS client/server examples and overall performance. Fixed issue with cleanup not unregistering the crypto callback. Added support for Microchip ATTPM20 part. Added support for Barebox (experimental). Added TLS benchmarking for CPS and KB/Sec. Enabled with TLS_BENCH_MODE. Added TLS client/server support for symmetric AES/HMAC/RNG. Enabled with WOLFTPM_USE_SYMMETRIC. Added TLS client/server support for mutual authentication. Added TIS locking protection for concurrent process access. Enabled using WOLFTPM_TIS_LOCK. Added symmetric AES encrypt and decrypt wrappers and examples. Added HMAC wrappers and examples. Added wrappers and examples for loading external HMAC and AES keys. Added delete key wrapper and example. Added ECDH support for ephemeral key generation and shared secret. Added benchmark support for RNG, AES (CTR, CBC, CFB) 128/256 and SHA-1, SHA-256, SHA-384 and SHA-512. Added new wolfTPM2_GetCapabilities wrapper API for getting chip info. Added command and response logging using ./configure --enable-debug=verbose or #define WOLFTPM_DEBUG_VERBOSE. Added option to enable raw IO logging using WOLFTPM_DEBUG_IO. Added option to disable TPM Benchmark code using NO_TPM_BENCH. Added examples/README.md for setup instructions. Tuned max SPI clock and performance for supported TPM 2.0 chips. Cleanup to move common test parameters into examples/tpm_test.h. Updated benchmarks and console output for examples in README.md. For more information about wolfTPM or other wolfSSL libraries, please contact facts@wolfssl.com. wolfSSL provides many different products, one of which is the wolfSSH library. wolfSSH itself provides a lightweight embedded SFTP solution. SFTP can be used to securely transfer files, and to manage the filesystem of a peer. 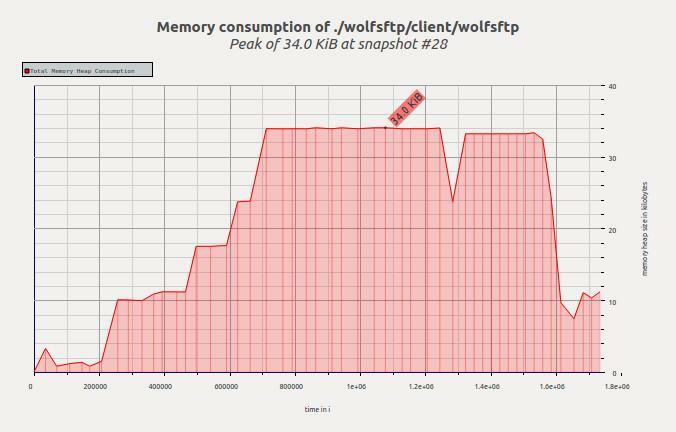 wolfSSH’s implementation of SFTP uses less than a third of the memory that OpenSSH does for a SFTP connection. 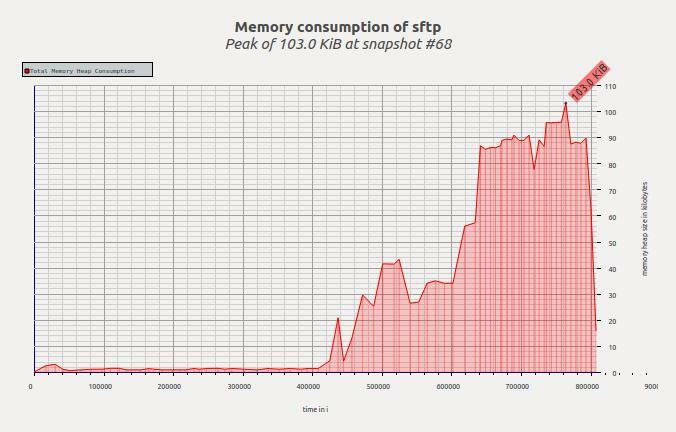 The following figures outline the performance of wolfSSH's SFTP solution compared with OpenSSH's performance. For more information about using wolfSSH and its features, please contact facts@wolfssl.com. Additionally, wolfSSL also provides support for using TLS 1.3! More information is available here: https://www.wolfssl.com/docs/tls13/.